WARNING: Following the practices in this article may be hazardous to your printer’s health, your ink cartridge budget, and the life expectancy of trees. Please continue at your own risk. Even though digital documents began in the 1950’s, they became available to most offices in the 1980’s with the development of the personal computer. Users could finally create and share digital information without the use of any print material of any type. At the same time, however, the rise in the use of digital printers grew at an amazing rate side by side personal computers. After almost thirty years of designing and developing student registration systems, I am always amazed at how often digital data is printed and distributed. The process seems counterproductive to me. During a recent meeting with a customer, however, the front office staff finally helped me understand the error in my thought process and why it is important to print everything. Here is a summary of what I learned. It is Monday afternoon, and I need thirty copies of the latest monthly report for my Tuesday morning meeting. I could email the PDF formatted report to the meeting participants, but it will take some time to put the email list together, compose the email, attach the report to the email, and send the email. What if I forget to attach the report the first time? I must then prepare a second email announcing my attachment error. Sounds time consuming and possibly embarrassing at the same time. Instead, I will send the document to my printer. I better make 35 copies just in case some unexpected guests are at the meeting. Or I could print one copy and then stand by the copier while my 35 copies spit out all nicely collated and organized. My copier does not have an automatic stapler so I will take care of that task back at my desk. As I stack the completed reports, I contemplate the days when printers and copiers did not exist. A scary thought. Suddenly, I wonder if I should have created a cover page. Is it too late to make changes? Every Friday afternoon, I get a printed report summarizing the week’s events such as enrollments, finances, cancellations, and other related information. This report provides me a nice overview of the week and helps me make some decisions for the coming week. It takes my staff some time to prepare the report, so I take into account that the report only contains data through Thursday. I can guesstimate the balance of the week into my decision-making process. The payroll office called me to confirm if a specific instructor taught a seminar scheduled for Thursday night. That reply was easy. My report shows me the course met the minimum, so I have no doubt the seminar ran. I go ahead and approve the payroll expenditure. Printed reports possess some form of magic. When I read them, it is difficult to imagine that what I am reading is not true or no longer accurate. It is the proverbial “black and white” right there in front of me. I know I cannot search too deep if I have questions, so I often take this report at its face value. It is not that outdated, is it? Those Friday reports? I have them all nicely filed away and can reference them whenever I need them. But we have more than just my Friday reports in our archives. The front office staff keeps all paper registration forms as a reference. And just in case, they print all registrations (even those taken online) as a backup. All these records are stored per session and year, so they are easy to locate. Granted, the number of filing cabinets is beginning to look somewhat like a maze. The office staff draws straws to see who will search the archives when a request for some information is requested for a past session. They often joke about tying a rope to the winner, so they can easily be found if they are not back in a reasonable amount of time. Maybe not forever, but stored papers will still be around long after I have retired. I have started to see some yellowing of some older records. That contrast with the black text is not that much more difficult to read than when the paper was crispy white. Although, I do know the paper we use is from a bid and not the highest quality. The records printed by a copier seem to fair better than those printed on inkjet printers. It must be that the copier carbon lasts longer than ink, especially if the ink is water-based. I do know however thermal prints won’t last long. Sometimes we see thermal prints fade quickly, such as those commonly printed as receipts. Some even in a matter of months. That’s why we make photocopies of all records printed on thermal paper. We know longevity is an issue, but they can handle that down the road after I am retired. We archive our data once a year. The older records are sent to the records storage room while the newer records are kept in the front office. I rarely worry about the security of our records. The front office is locked when we are closed. And when we are open, the staff make sure that someone is always in the office even with walk-in registrations and students coming into the office daily. The storage room is always locked as are all the filing cabinets. The keys are kept safely in a desk drawer in the front office. The only other people who have access are the cleaning and maintenance staff, both day and night. Besides, who would want to enter the maze by choice? I assume by now it is evident that my intent is to be humorous. That may be a dangerous line to walk, but the recommendations are meant to be entertaining and possibly trigger an analysis of your situation. This article was not based on a meeting with a specific customer. Instead, it was based on years of live observations and comments from a variety of sources. In reality, the need to print digital documents is becoming less and less important. Customers are more often expecting a digital document over printed material, and the trend seems to be heading more in that direction. However, I am amazed at how much printing continues to take place in the average office. 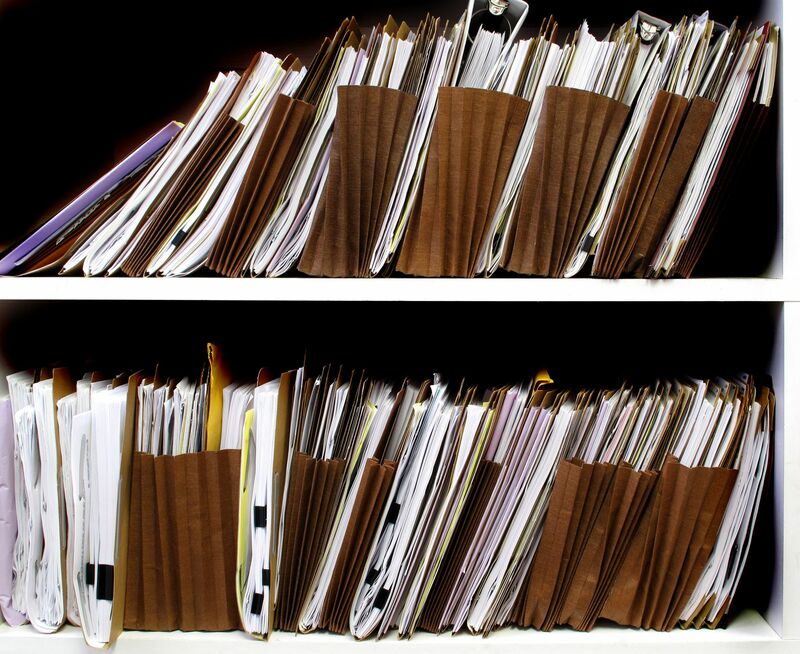 Maybe it is time for each of us to update our goals towards a paperless office.